VINCENT BOBERSKI is a senior vice president and partner at Vining Sparks IBG, a broker/dealer for institutional investors. He was a senior vice president at FTN Financial and a managing director and head of fixed income research and strategies at RBC Capital Markets. Boberski began his career at the Federal Reserve Bank of Richmond. He holds an MBA from the University of Chicago; an undergraduate degree from William & Mary, where he was a Wilson Scholar; and the CFA and PRM designations. Boberski is a regular contributor to CNBC and Bloomberg TV and radio. He speaks frequently at institutional investment conferences and is quoted often in the financial press. He lives in Memphis with his wife Anne, two children, and more dogs than are strictly necessary. 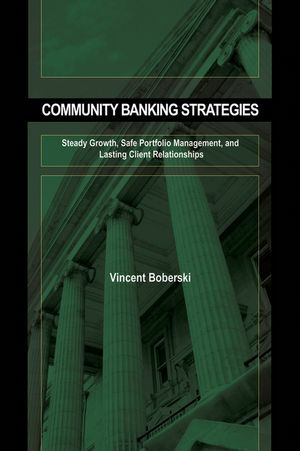 A Five-Forces Analysis of the Competitive Position of Community Banks. 2 Historical Credit Crises and What's Different Now. 5 Managing the Balance Sheet Through Different Interest-Rate Cycles. SBA Floating- and Fixed-Rate Pools. Macro, One-Way, and Two-Way (or Client) Hedging Examples.